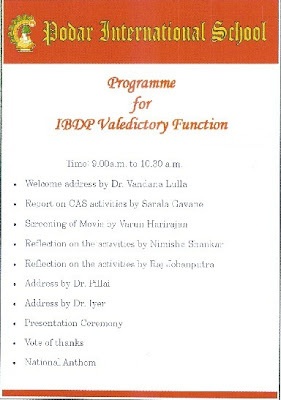 Indian Development Foundation jointly with Podar International School, Santacruz (W), Mum bai organized a valedictory function on Saturday the 28th April to honour the students who have successfully completed 150 hours of CAS activities during 2006-07. The students of Podar International School were honoured with the IDF Certificate of Merit for their excellent participation in social service activities during the year 2006-07. Helping the visually challenged people, sharing thoughts with grandparents in oldage homes, understanding the life of leprosy, TB and cancer patients and counseling them for a better living were some of the activities the students had undertaken. The Director of Podar International School Dr. Vandana Lulla said Creativity, Action, Service (CAS) is a fundamental part of the International Baccalaureate Diploma Programme (IBDP) which deals with the importance of life outside the world of scholarship, providing a refreshing counterbalance to academic studies. CAS helps the students to have an insight into the life which is beyond studies. The Founder President of Indian Development Foundation, Dr. A. R. K. Pillai said the students have gone far beyond in the quest for happiness for the deprived sections of the society. When students are busy with their studies and other activities, taking time off for social service is indeed praiseworthy. The social services rendered by the students of Podar need to be written in letters of gold, Dr. Pillai said. 38 students from Podar International School were honoured with IDF Certificate of Merit and were also given an Appreciation Note for their wonderful work. Narrating her experience, one of the CAS students Nimisha Shankar said it is worth mentioning my first visit to a leprosy home in Mumbai where I worked for the kids in the centre. From day one, I was so attached to the kids that I wish to go back and serve them, added the 16-year old student. Another student Raj Jobanputra too had his feelings to share. My views about leprosy patients got changed when I visited Vimala Centre. I now look at leprosy patients as normal human beings, and therefore it has been an eye opener for me. CAS has indeed helped me to change my thinking about the world around me. I was born with a silver spoon in the mouth, but it was only when I started going to such places, that I realized the world outside was a lot more different. I thank IDF for inculcating social values in us, asserted Raj. The Secretary of IDF Dr. CNN Nair and the National Co-ordinator of IDF Dr. Narayan B. Iyer also spoke on the occasion and enthused the students to keep up social values as they graduate from one level to another. CAS Co-ordinator Mrs. Sarala Gavane gave a complete report of the year-long social service activities carried out the students in various fields. I am overwhelmed by seeing the excellent responses from the students as well as their parents, as I imbibe in them social values, said Mrs. Sarala Gavane. 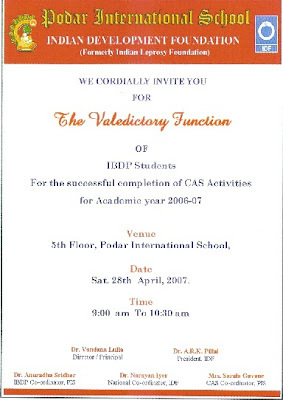 Podar International School and Indian Development Foundation is organising a Valedictory Function on 28th April 2007 at Podar School premises to honour the IBDP students for the successful completion of CAS Activities for Academic Year 2006-07. Creativity, action, service (CAS) - The CAS requirement is a fundamental part of the IBDP and takes seriously the importance of life outside the world of scholarship, providing a refreshing counterbalance to academic studies. The students of Podar will be honoured during the function for their excellent participation in leprosy/ TB and allied social activities under the banner of Indian Development Foundation. Mrs. Vandana Lulla was awarded the Degree of Doctorate by the Open International University for Complementary Medicines, Colombo at a Convocation ceremony held at Russian Cultural Centre, Mumbai on Sunday the 22nd April 2007. Dr. Vandana Lulla received this degree for her research work `Managing Learning Disability Through Technology'. Dr. Vandana is the Director of Podar International School in Mumbai and a great supporter of Indian Development Foundation. Like Martin Luther's famous opening statement `I have a dream......', Dr. Vandana too had a dream to attain the degree of Doctorate in Education. Dr. Vandana did extensive research on students using psychological testing to identify their disability areas. Remedies were designed using technology as a bait to combat their disability. The results were astounding. Deemed as failures by their past schools, they secured 1st class using Dr.Vandana's technological strategy. Hon'ble Mr. Janusz Bylinski, Consul General of the Republic of Poland presented the Degree to Mrs. Vandana Lulla. Dr. Meher Master Moos, President of Zoroastrian College, Famous Astrologer Dr. Harish Dhutia, and Dr. A. R. K. Pillai were present during the presentation. The other dignitaries present were Vice Consul of Russia Mr. Andrei Nazark, Consul General Mr. Wijeratne and Consul Mr. Lakshitha Ratnayake from Democratic Republic of Sri Lanka also witnessed the event. Dr. C. N. N. Nair, Hon. Secretary and Dr. Narayan B. Iyer, National Co-ordinator of Indian Development Foundation also witnessed the glittering event. Indian Development Foundation takes this opportunity to congratulate Dr. Vandana Lulla on her receiving the degree of doctorate and wish many more laurels in the days to come. We seek your kind support in eliminating leprosy in India. Join hands with IDF. The team leaders of Grant Thornton Acumen gave a warm welcome to Dr. A. R. K. Pillai and Dr. Narayan B. Iyer of IDF on Thursday the 19th April. Mr. Raja Ram, Mr. Jay Ramesh, Mr. Rajendran Varma alongwith their core team received IDF team at the Grant Thornton Acumen office in Gaborone. Dr. Pillai and Dr. Narayan gave a presentation on IDF's working in the humanitarian field in India. They gave an overall picture of the social scenario in India. IDF team took the opportunity to thank the GTA team for their contributions made to IDF from time to time supporting different projects in India. Dr. Pillai congratulated GTA team for the wonderful progress made in Botswana. He wished the team good luck in their endeavours. Mr. Raja Ram and Mr. Jay Ramesh conveyed their best wishes to the IDF team for their dedication in the social field. Later, IDF team were shown round the office and introduced them to team in different departments. Let noble thoughts come to us from everyside. Rigveda. Hon'ble Mr.Patrick K. Balopi, MP, Speaker of the National Assembly, Republic of Botswana received IDF team this morning at his office in the Parliament. Dr. Pillai explained IDF's national level activities in India. He also expressed his desire to share the Indian experiences and ideas with the NGOs in Botswana. Hon'ble Speaker appreciated the work of IDF and congratulated Dr.Pillai for carrying out such a magnificent humanitarian work in India. Hon'ble Speaker recorded deep compliments for IDF team visiting his country and sharing novel thoughts for betterment of the nation. He wished IDF good luck in its activities. He also expressed his desire to visit IDF projects during his visit to India. Mr. T. N. Anil, the newly appointed IDF Ambassador in Botswana took keen initiative in arranging the meeting. Dr. Pillai was joined by Mr. Girish, Dr. Iyer and Mr. Anil when they called on Hon'ble Speaker of Botswana. Mr. Ramachandran Ottappath, Director of Choppies (a chain of Fast Moving Consumer Goods outlets) welcomed Indian Development Foundation (IDF) members in Gaborone on Wednesday the 18th April. Ram, as he popularly known, was all praise for the excellent humanitarian services rendered by IDF to all sections of people without any discrimination whatsoever. He was happy to identify with IDF and support its activities as best as possible. A kindhearted person with radiating benevolence, Ram has been supporting a couple of social projects in his personal capacity. He appreciated the role of IDF in leprosy elimination programme in India. The IDF team included Dr. A. R. K. Pillai, Mr. R. Girish, Dr. Narayan B. Iyer and Mr. T. N. Anil. Dr. Pillai congratulated Mr. Ram for the excellent progress made by him in Botswana establishing a brand in the area of consumer goods. Catering consumer goods to a large section of Botswana population, Mr. Ram has been a successful businessman with excellent value systems. IDF wishes Mr. Ram good luck in his endeavours. The Former President of Botswana and the recipient of Mahatma Gandhi International Peace Award, Sir Ketumile Masire received the IDF team at his palace in Gaborone on Monday the 16th April. Sir Ketumile Masire was all praise for the excellent service rendered to humanity by Indian Development Foundation for nearly 25 years. Sir Masire said, sharing of Indian experience with Botswana is an excellent proposition in regard to public health and education'. The NGOs in Botswana and IDF may come together for greater understanding and sharing of experiences, Sir Masire added. Sir Masire applauded the contribution of Indian people in Botswana for participating in the overall development and progress of the country. 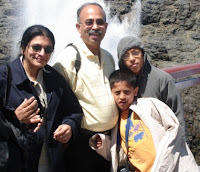 The IDF team led by Dr. A. R. K Pillai included Mr. R. Girish, Dr. Narayan B.Iyer and Mr. T.N. Anil. Dr. Pillai apprised Sir Masire of IDF's humanitarian activities in India. Dr. Narayan mentioned that the whole NGO work in India was managed through public participation. Earlier Mr. Anil introduced the IDF team to Sir Masire. For the report on Sir Ketumile Masire receiving the Mahatma Gandhi International Peace Award, please click the link below. Velankannai School, Pondicherry, partipated in the TB awareness campaign organised by Indian Development Foundation. The Students of the school went around zealously spreading awarness to the parents and relatives on facts about TB. They emphasised the need for early detection and complete treatment. They raised the slogan - TB anywhere is TB everywhere. Mr.C. Chidamaram, Manager - SR of IDF appreciated the efforts of young budding students' self-service in conscientising the society. Congratulating the stupendous work by the school team. Mr.Chidambaram presented a Special Memento to the Correspondent of the school. The school management of the school appreciated the work of IDF and expressed their desire to extend support in future too. health, happiness and peace everywhere. Dr. A.R.K. Pillai, Mr. R. Girish and Dr. Narayan B. Iyer called on Mr. Adam Arbi, supporter of IDF at his farm located at Mochudi in Botswana (Africa). IDF team thanked Mr.Adam Arbi for his regular support to leprosy/ TB programmes in India. Dr. Pillai apprised Mr. Adam Arbi of the activities of the Foundation. Mr. Adam Arbi congratulated Dr. Pillai and his team for the wonderful humanitarian work being carried out in India. He appreciated the empowerment programmes run by IDF in different parts of India. Mr. Adam Arbi took some time off to show his farm to the IDF team. Mr. Adam's bubbly son Mikael greeted the visiting team and gave a smile full of love. IDF family wishes Mr. Adam Arbi and his family a happy time ahead. Dr. A. R. K. Pillai, Mr. R. Girish and Dr. Narayan B. Iyer called on His Excellency Mr. Vishnu Hade, Indian High Commissioner of Botswana at his office in Gaborone this morning. Dr. Pillai presented a PR Plan for initiating Indo-Botswana Relationship giving broad details of strengthening ties between the two countries. The High Commissioner appreciated the move of Dr. Pillai and welcomed the suggestions. Mr. Girish, the Cricket Umpire for Botswana and Treasurer of Botswana Cricket Association talked about promoting Cricket in Botswana. The High Commissioner proposed to hold a Cricket Match of the team India for mobilising funds for supporting AIDS programme in Botswana. Dr. Narayan Iyer apprised the Indian High Commissioner with the programmes of IDF in national level. The High Commissioner congratulated IDF team for the wonderful humanitarian work carried out by the Foundation in India. Mr. Jay Ramesh, Managing Partner, Grant Thornton Acumen, Botswana and Chairman for Sub Saharan African Region donated a handsome amount to Indian Development Foundation to sponsor education for poor children in India. Mr. Ramesh has been a great support for the cause of health and education in India for the past few years. IDF thanks Mrs. Pushpa Ramesh and Mr. Jay Ramesh for their kind and continued support. Mrs. Aparna Vijay and Mr. Vijay Kalyanaraman from Grant Thornton Acumen, Gaborone expressed their solidarity with the poor children of India. Dr. Pillai, Mr. Girish and Dr. Narayan called on Mr. Vijay and family on Wedesday the 4th April. They explained the activities of IDF in India. Sponso rship of poor children and empowerment classes in India were the main topics that were discussed. Mr. & Mrs. Vijay who have been supporting a couple of social programmes were moved by the talk and presented a cheque for the cause. Mr. & Mrs. Vijay congratulated the team for the wonderful work and appreciated the efforts of IDF in the overall developmental areas. IDF team thank the benevolent gestures of Mr. Ramesh and Mr. Vijay.